Flour Mayhem: Another rainy day! Ohh ohhhh ohhhh, how I love you rainy day. I'm not really much for sunshine and birds chirping. I'd rather stay inside, listen to the sound of the rain hit the window/roof, and bake something that'll put a smile on someones face. So, after Jason and I ventured out to get lunch and crap, then we came home and he startd to draw, so I needed something to keep busy. So, I did what I do best. Or what I'd like to think that I do best ;) I made left over brownies.. Used whatever I had hanging around ya know. 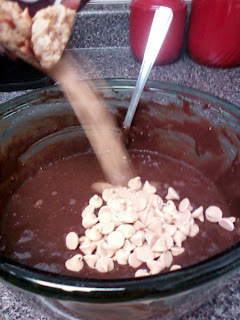 Brownie mix, some leftover ingredients from various things I've made the last week or so, and viola! Something pretty tasty happened, and it was lovely. I kinda dig it, just a little. Preheat oven to 350 degrees. Spray 9 inch pie plate with cooking spray - This is just what I used, you can use whatever kind of pan you'd like. 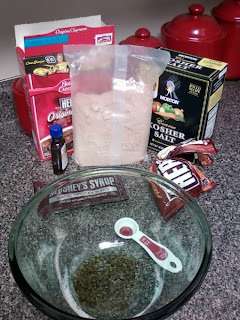 Mix all ingredients except butterscotch chips until combined and no lumps. Gently stir in butterscotch chips. Pour into dish. Bake for 35-40 minutes, or until desired doneness. 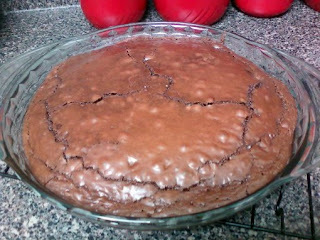 I cooked mine for only the minimal time since I like fudgy gooey brownies. Heck yeah! What a way to clean out the kitchen. Looks good huh? I bet they taste good too.. Let's go have some!! !